We are now in Mt Beauty for 8 days and back in 3G territory. After Beechworth we spent 4 enjoyable days in Eldorado, very quiet caravan park with lots of trees, very different to when we last camped here in 1976. 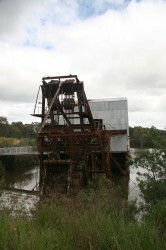 We visited the large dredge that worked Reedy Creek from 1934 to 1954. 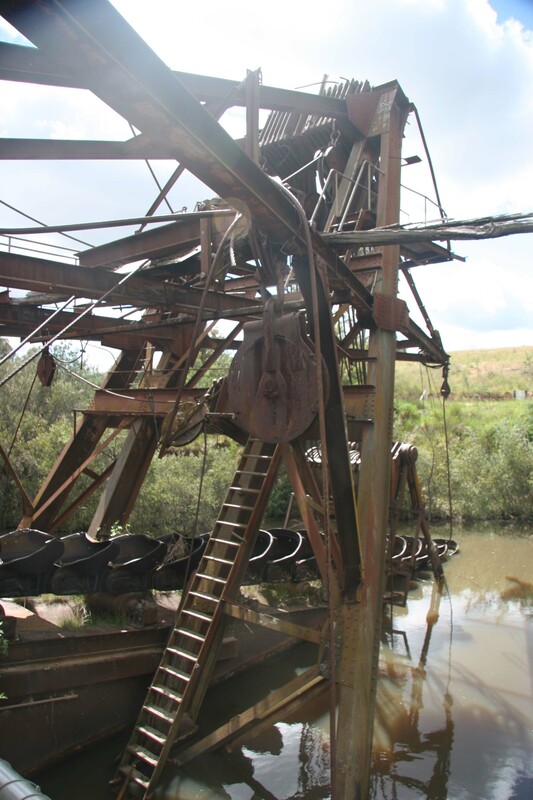 It is a massive machine, 200 and 300 HP motors to drive the bucket chain and the tumbling machine. There are 110 buckets each weighing 1.6 tonnes, and the machine was the largest user of electricity after Melbourne and Geelong and could be heard 10 Km away. 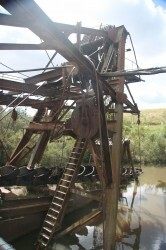 The machine floated in a pool of water tethered to the banks via pulleys and cables, which pulled the dredge along as it dug out the gravel. It extracted 70,664 oz of gold and 1,366 tons of tin from 35,368,000 cubic yards of gravel and dirt. Quite an operation. 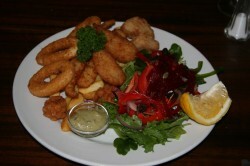 We also enjoyed a seafood basket at the McEvoy Tavern in Eldorado, last time here there was just a shop. 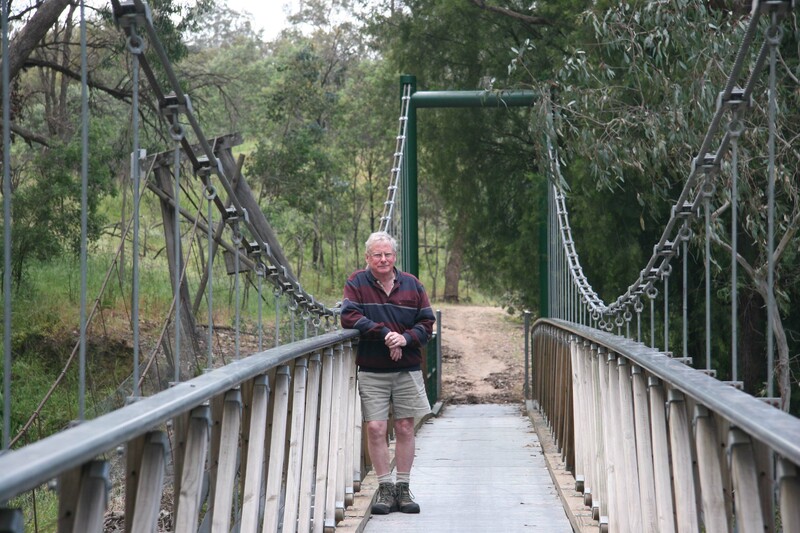 We also went for a walk along Reedy Creek to work some of the lunch off our waistlines, the old swing bridge we used last time is closed, but the cables can be seen in the background next to the handsome guy on the bridge!! 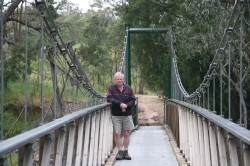 We made the same drive to Beechworth through the Woolshed Valley that follows Reedy creek to Beechworth. We enjoyed it so much we went along this road on three different days. 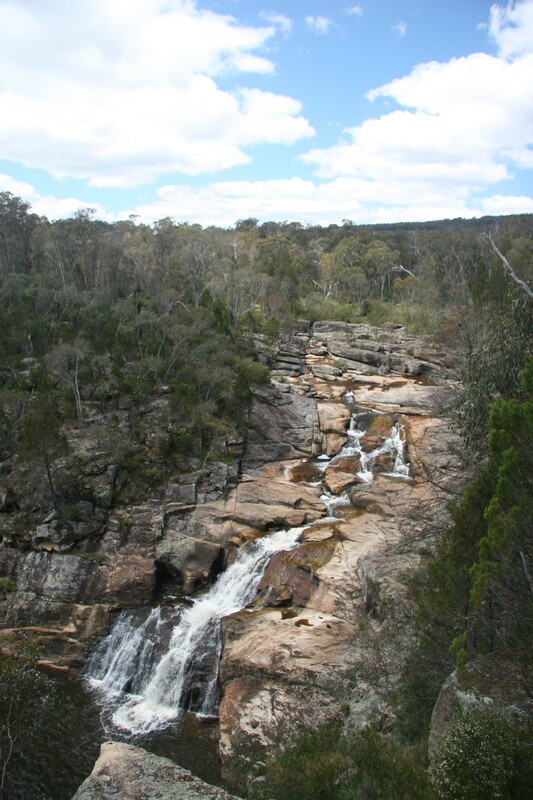 It is a very historic valley, Arron Sherritt, an associate of Ned Kelly, lived in the valley and Ned stayed here from time to time, the last being 36 hours before the siege at Glenrowan. The road now travels through bush all the way, but in the 1850’s was home to 6000 people and 5 towns with many pubs, eating places, and Chinese run vegetable gardens. No evidence of all this activity remains except some water races and creek diversions. 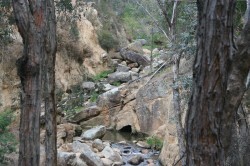 We enjoyed a fire BBQ picnic at Woolshed Falls. In the fifties the creek was diverted around the falls and the pool at the base of the falls drained to allow the extraction of 2000 oz of gold. We saw some more Tiger Orchids and a couple of Spider Orchids that were passed (or past if you prefer) their best, unfortunately. 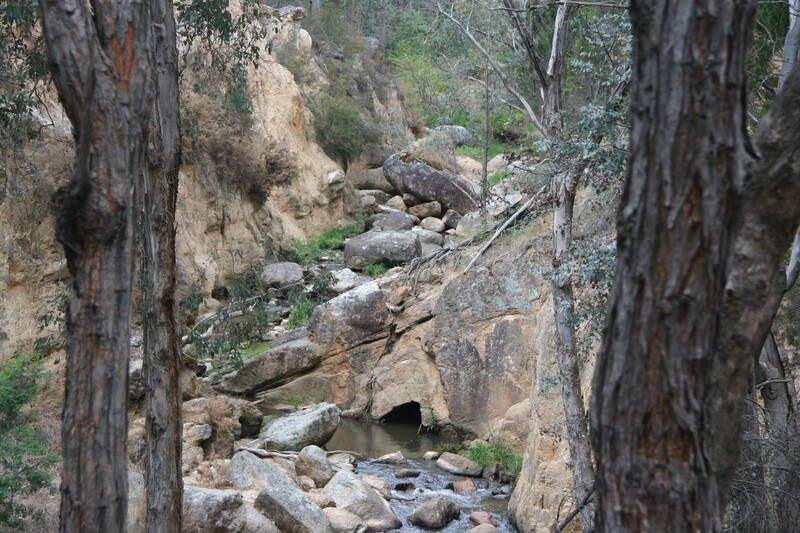 The miners dug water races in solid granite and also a tunnel to divert the creek, you can just see the tunnel in the picture of the creek in an eroded gully, this gully was eroded by the miners using water cannons, no concern about the environment! 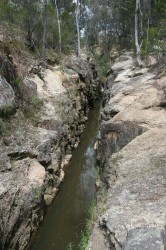 On the road to Woolshed Falls we passed Buttrey’s Rock were bushranger Buttrey hid before robbing a coach. 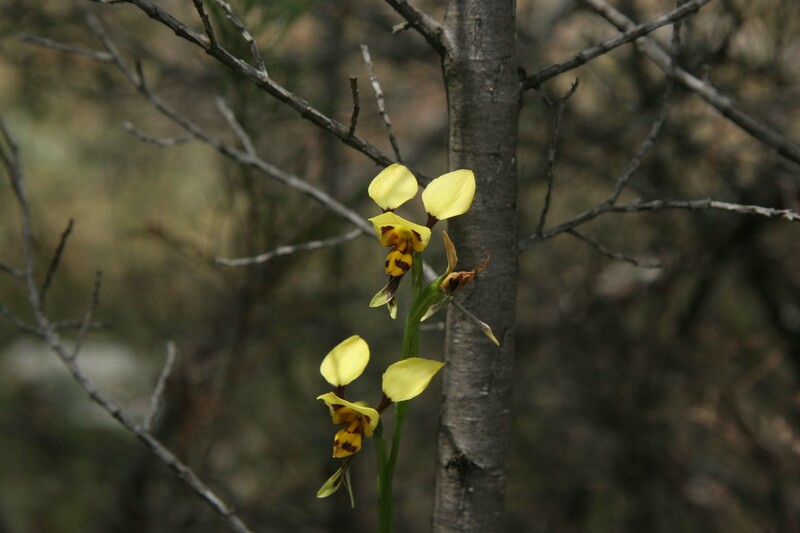 He buried the gold in the valley before he was captured soon after at Eldoado, and the gold has never been recovered. After another couple of enjoyable fire BBQs alongside the creek we moved to Nug Nug, a bush camping area 13 Km south of Myrtleford for a night. No 3G, radio or TV at Nug Nug, and when we smelt smoke and then heard crackling we couldn’t call the CFA so we had to drive around to check it out, fortunately a farmer burning off. We enjoyed the drive through Happy Valley to Mt Beauty for cup weekend. We will be here for 8 days. Hi Guys. Looking forward to arriving on Friday with a cold beer to enjoy with you. Enjoy the pre-weekend serenity…..